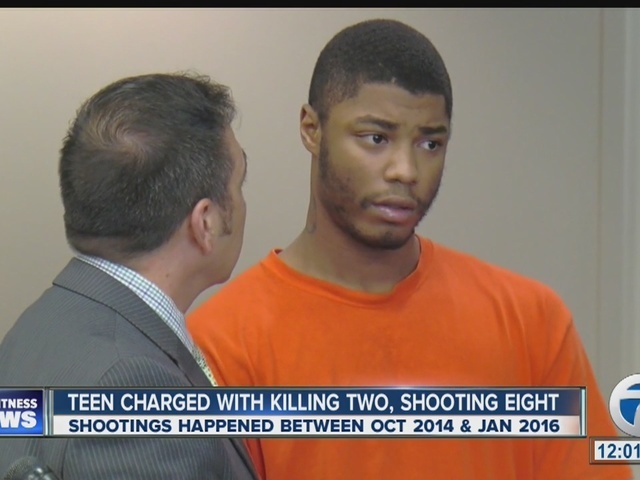 A Buffalo teenager is facing 19 charges relating to a number of shootings that left two people dead and six others injured. 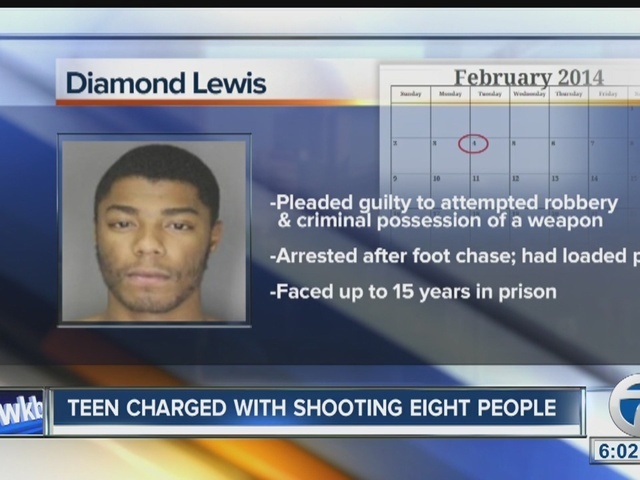 The Erie County District Attorney's Office said 19-year-old Diamond Lewis shot eight different people at four different locations between October of 2014 and January of 2016. In total, two men were killed, and a number of other people were shot, including a 13-year-old girl, an 18-year-old woman, another woman who was shot five times as well as one man who is permanently paralyzed. He pleaded not guilty to two counts of murder, six counts of attempted murder, six counts of assault and five counts of criminal possession of a weapon. Officials say the first homicide happened October 14th, 2014, when 22-year-old David Skipper, Jr. was shot on Erb Street. The second homicide happened June 6, 2015, when 18-year-old Alonzo Scott was shot on Warren Street. That shooting also left his male victim paralyzed and three others injured. "Right now they're just allegations. The state has to prove everything they are charging Mr. Lewis with," said Lewis' attorney. "From my understanding one of the charges comes from October 2014 to think that they waited so long to indict him on the charges means they may be in a difficult spot to prove." Lewis' attorney said that evidence includes witness identification, which can be argued in court, and DNA evidence on a weapon. However, the attorney stated that two other DNA profiles were found on that weapon. Acting District Attorney Mike Flaherty said he could not comment on evidence. However, he stated that a small group of criminals in Buffalo commit a large number of the violent crimes. "Mr. Lewis is accused of being a very violent man, whose removal from the street is very important and critical in maintaining the safety of his neighborhood," Flaherty said. Lewis was remanded without bail, and faces 25 years to life on each murder count, as well as 200 years in prison on the remaining charges. During arraignment, attorneys stated that Lewis had been granted a youthful offender status for an attempted robbery and weapons charge several years ago. Those records have been sealed and the crime has been wiped from his record. If he had been charged as an adult, Lewis would have served 3.5 to 15 years behind bars. It is unclear how much time he actually served, if any. City leaders urge citizens that, "if you see something, say something." "The days of minding your business are over," said Council Member Ulysses Wingo, who represents the Masten District. "It is your business to ensure that our communities are becoming better and safer for everyone that lives in them." "We know of four cases (involving Lewis) that we believe we can prove. We believe he's also involved in many more," said Buffalo Police Commissioner Daniel Derenda. Anyone with information should call the Buffalo Police Confidential TIPCALL line at 847-2255.